Download "GRADUATE FACULTY COUNCIL DOC. NO. 871 APPROVED NOVEMBER 19, 2001"
2 Graduate Faculty Council Doc. No. 871 p. 2 Approved November 19, 2001 Emphasis in Administrative Leadership and Supervision 1. PhD Non-certification Orientation Ad Ldsp 862 Economics of Education, 3 cr. Ad Ldsp 860 Administrative Behavior, 3 cr. Ad Ldsp 832 Educational Politics & Policy-Making, 3 cr. 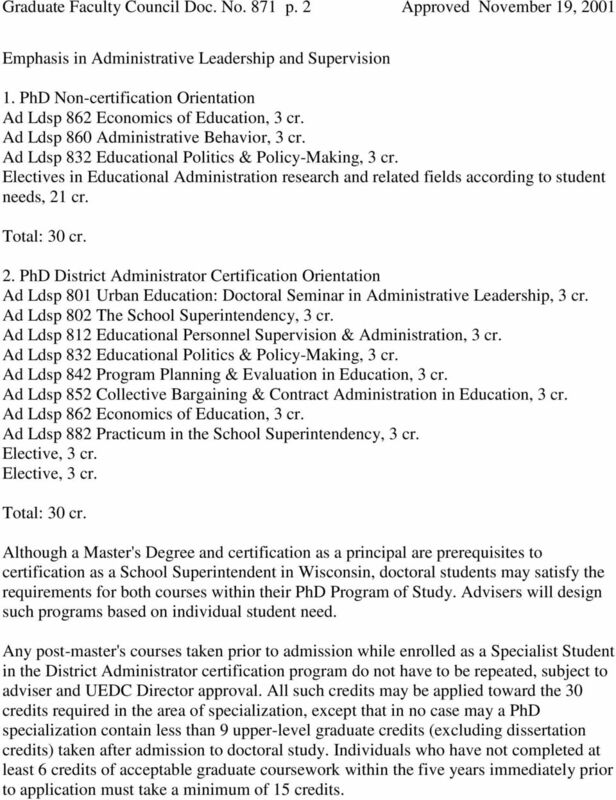 Electives in Educational Administration research and related fields according to student needs, 21 cr. Total: 30 cr. 2. PhD District Administrator Certification Orientation Ad Ldsp 801 Urban Education: Doctoral Seminar in Administrative Leadership, 3 cr. Ad Ldsp 802 The School Superintendency, 3 cr. Ad Ldsp 812 Educational Personnel Supervision & Administration, 3 cr. Ad Ldsp 832 Educational Politics & Policy-Making, 3 cr. Ad Ldsp 842 Program Planning & Evaluation in Education, 3 cr. Ad Ldsp 852 Collective Bargaining & Contract Administration in Education, 3 cr. Ad Ldsp 862 Economics of Education, 3 cr. Ad Ldsp 882 Practicum in the School Superintendency, 3 cr. Elective, 3 cr. Elective, 3 cr. Total: 30 cr. 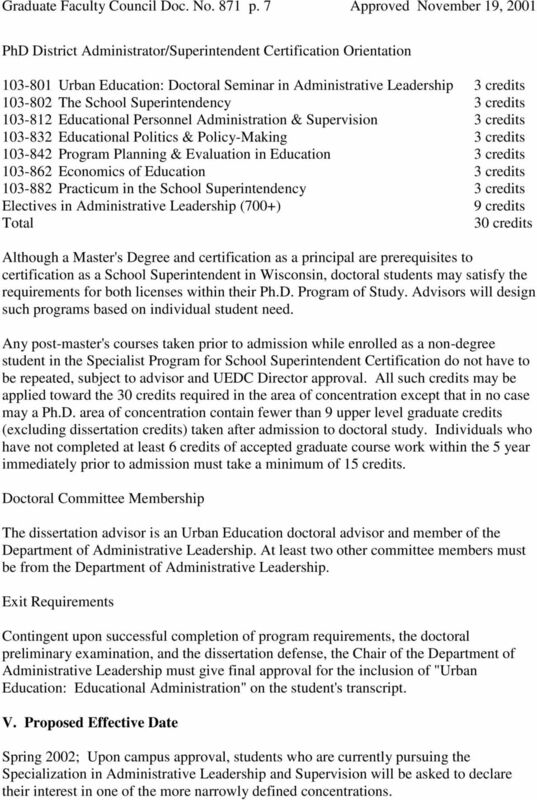 Although a Master's Degree and certification as a principal are prerequisites to certification as a School Superintendent in Wisconsin, doctoral students may satisfy the requirements for both courses within their PhD Program of Study. Advisers will design such programs based on individual student need. Any post-master's courses taken prior to admission while enrolled as a Specialist Student in the District Administrator certification program do not have to be repeated, subject to adviser and UEDC Director approval. 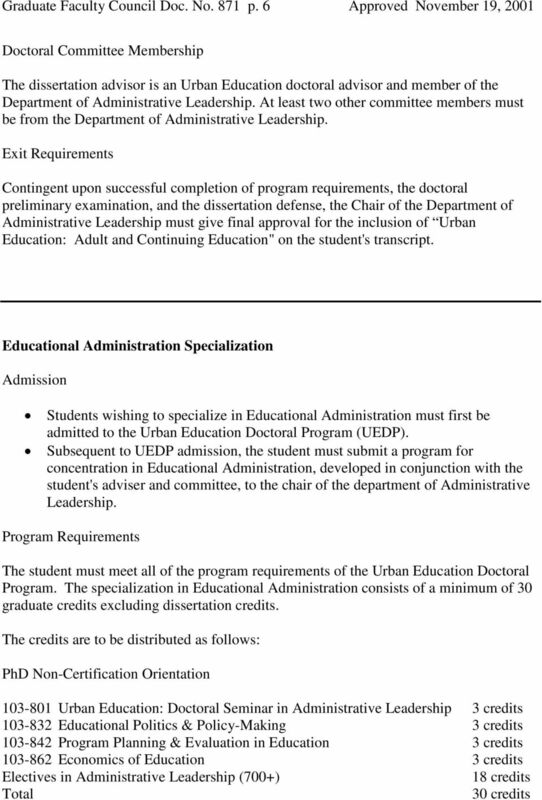 All such credits may be applied toward the 30 credits required in the area of specialization, except that in no case may a PhD specialization contain less than 9 upper-level graduate credits (excluding dissertation credits) taken after admission to doctoral study. Individuals who have not completed at least 6 credits of acceptable graduate coursework within the five years immediately prior to application must take a minimum of 15 credits. 4 Graduate Faculty Council Doc. No. 871 p. 4 Approved November 19, 2001 Continuing Education Leadership. Further, the availability of specializations in Educational Administration and Adult and Continuing Education Leadership with an urban program focus responds to national needs and interest in these areas. Secondly, students who complete our program would be advantaged in the marketplace if they received transcript designations of Educational Administration or Adult and Continuing Education Leadership. Such a designation conveys a stronger content and discipline base than the broad title currently used. Finally, there is demand for both programs on a national and regional scale. 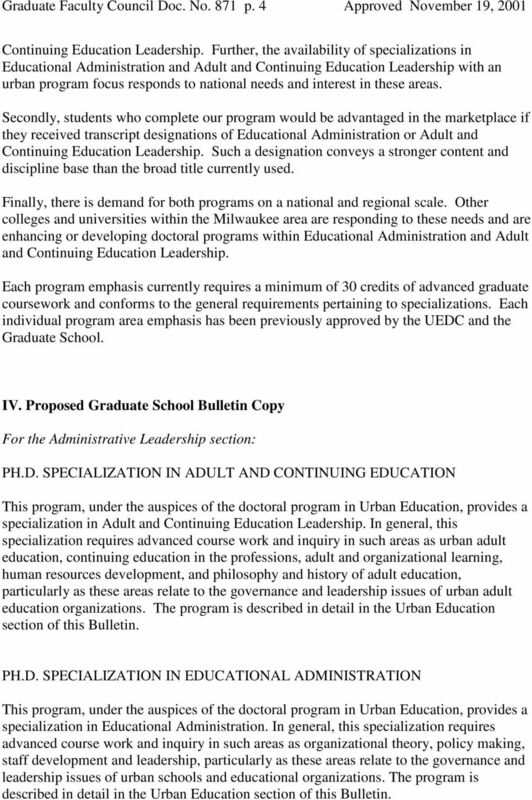 Other colleges and universities within the Milwaukee area are responding to these needs and are enhancing or developing doctoral programs within Educational Administration and Adult and Continuing Education Leadership. Each program emphasis currently requires a minimum of 30 credits of advanced graduate coursework and conforms to the general requirements pertaining to specializations. Each individual program area emphasis has been previously approved by the UEDC and the Graduate School. IV. 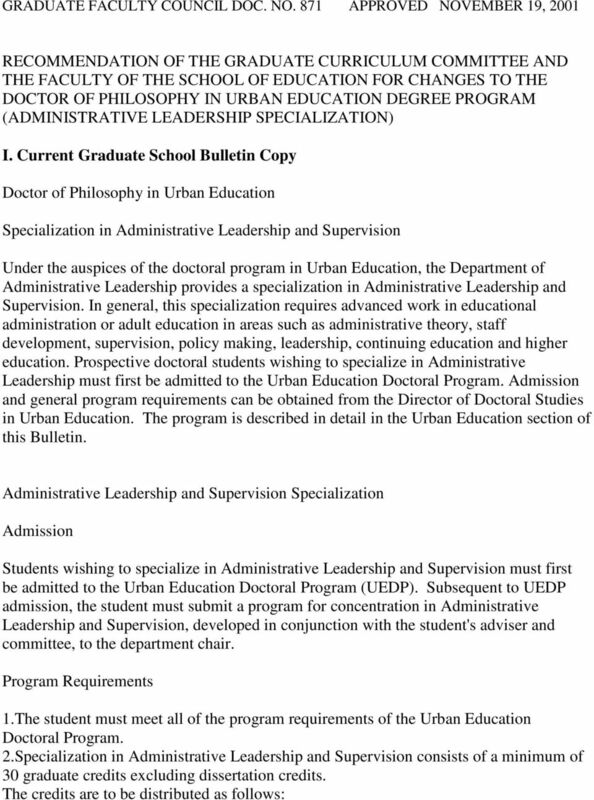 Proposed Graduate School Bulletin Copy For the Administrative Leadership section: PH.D. SPECIALIZATION IN ADULT AND CONTINUING EDUCATION This program, under the auspices of the doctoral program in Urban Education, provides a specialization in Adult and Continuing Education Leadership. In general, this specialization requires advanced course work and inquiry in such areas as urban adult education, continuing education in the professions, adult and organizational learning, human resources development, and philosophy and history of adult education, particularly as these areas relate to the governance and leadership issues of urban adult education organizations. The program is described in detail in the Urban Education section of this Bulletin. PH.D. 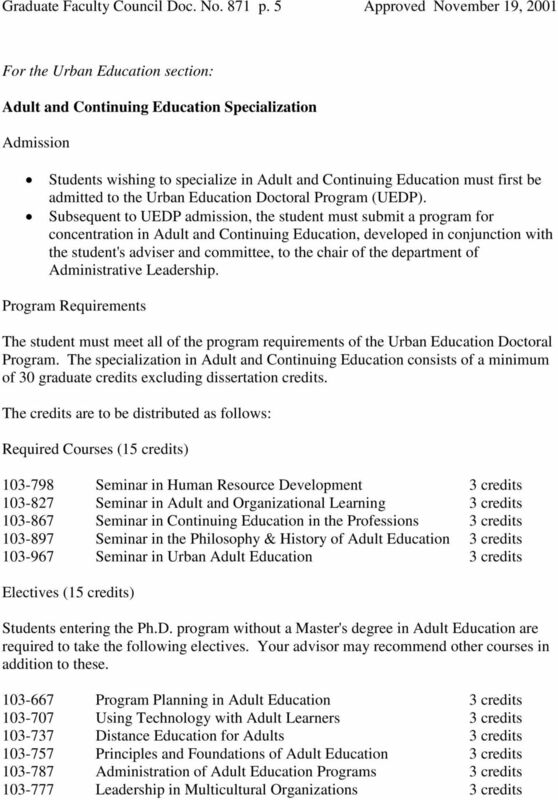 SPECIALIZATION IN EDUCATIONAL ADMINISTRATION This program, under the auspices of the doctoral program in Urban Education, provides a specialization in Educational Administration. In general, this specialization requires advanced course work and inquiry in such areas as organizational theory, policy making, staff development and leadership, particularly as these areas relate to the governance and leadership issues of urban schools and educational organizations. The program is described in detail in the Urban Education section of this Bulletin. 7 Graduate Faculty Council Doc. No. 871 p. 7 Approved November 19, 2001 PhD District Administrator/Superintendent Certification Orientation Urban Education: Doctoral Seminar in Administrative Leadership 3 credits The School Superintendency 3 credits Educational Personnel Administration & Supervision 3 credits Educational Politics & Policy-Making 3 credits Program Planning & Evaluation in Education 3 credits Economics of Education 3 credits Practicum in the School Superintendency 3 credits Electives in Administrative Leadership (700+) 9 credits Total 30 credits Although a Master's Degree and certification as a principal are prerequisites to certification as a School Superintendent in Wisconsin, doctoral students may satisfy the requirements for both licenses within their Ph.D. Program of Study. Advisors will design such programs based on individual student need. Any post-master's courses taken prior to admission while enrolled as a non-degree student in the Specialist Program for School Superintendent Certification do not have to be repeated, subject to advisor and UEDC Director approval. All such credits may be applied toward the 30 credits required in the area of concentration except that in no case may a Ph.D. area of concentration contain fewer than 9 upper level graduate credits (excluding dissertation credits) taken after admission to doctoral study. Individuals who have not completed at least 6 credits of accepted graduate course work within the 5 year immediately prior to admission must take a minimum of 15 credits. 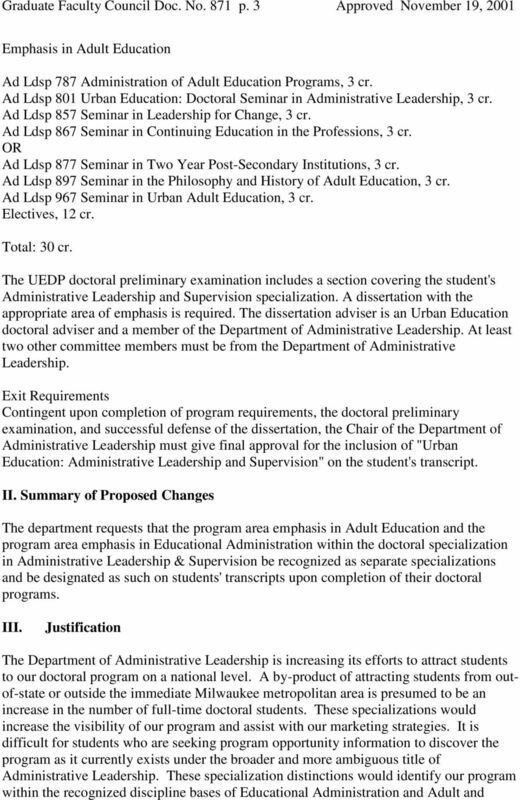 Doctoral Committee Membership The dissertation advisor is an Urban Education doctoral advisor and member of the Department of Administrative Leadership. At least two other committee members must be from the Department of Administrative Leadership. Exit Requirements Contingent upon successful completion of program requirements, the doctoral preliminary examination, and the dissertation defense, the Chair of the Department of Administrative Leadership must give final approval for the inclusion of "Urban Education: Educational Administration" on the student's transcript. V. Proposed Effective Date Spring 2002; Upon campus approval, students who are currently pursuing the Specialization in Administrative Leadership and Supervision will be asked to declare their interest in one of the more narrowly defined concentrations. 8 Graduate Faculty Council Doc. No. 871 p. 8 Approved November 19, 2001 VI. Additional Resource Needs No additional facilities or library resources are anticipated as a result of the proposed changes. Advanced Practice Nursing Master s Degree Option: Nurse-Midwifery (49 credits) Designed to prepare scholarly, clinically specialized nurses who will function at an advanced level of practice as nurse-midwives.